A new mini elephant design! This is a commissioned piece that we recently completed. 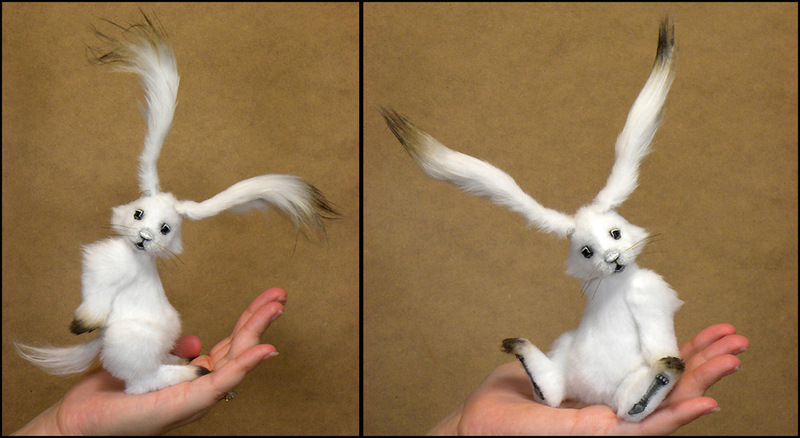 He stands approximately 5" tall and is created from a wonderfully soft and dense Tissavel fur. He features hand painted bright blue glass eyes and lots of details! More info and availability here. This is Harvey, a commissioned hare that we finished a few days ago. A new design. He stands approx. 16" to the tips of his ears. Created from alpaca with hand painted deep blue glass eyes. Available here. An interesting piece of Tissavel. The clusters are formed to a matrix to create a feather-like texture. The color is light grey with a touch of blue. I really like it, so I decided to give it a go for a new owl. Here is the finished piece. This is Neo, a new 5" Owl. He features movable wired wings, ears and tail. Painted glass eyes and sculpted details. Neo - 5" Owl available here. New Owl designs. These are just over 6" tall, finished in acrylics and artist inks. This is Coral, the first of several mini pig commissions that we are currently working on. Made a few changes to the original design for this one. The last set are on their way home! Just finished this new design last night...a Snow Hare. Created from a fluffy white faux fur with lots of tiny details added. More info about Drift here!